My take on the week's news, plus some fun and inspiring extras. 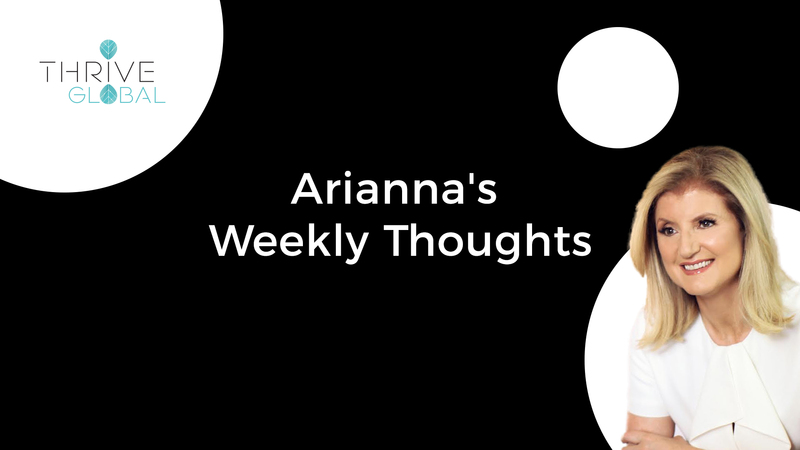 In case you missed it, here’s the text of my new Weekly Thoughts newsletter. Each weekend I share my take on the week’s biggest news stories, my favorite pieces on how we can thrive even in our stressful world, and some fun and inspiring extras. Subscribe here. And if you haven’t already, be sure to subscribe to Thrive’s daily newsletter highlighting our favorite reads with actionable tips for enhancing your well-being, productivity, and sense of purpose. • Royal Treatment: Prince Harry will be teaming up with his royal counterpart from the U.S. — Her Royal Highness Oprah, obvs — for an Apple TV series about mental health. Names for the joint venture so far do not include Hoprah. • Take my reputation, please! Attorney General William Barr claimed the investigation of the 2016 Trump campaign amounted to “spying,” continuing the amazing willingness of Trump officials to allow their legacy to be irretrievably sucked into the Trump Event Horizon. This week I was delighted to present Katy Perry with the 2019 Inspiration DVF Award. She fearlessly shares the wisdom she gathers through pain and through joy with the world and shows us all how to live our lives with more wisdom, more connection, and more grace so that we never get so busy making a living that we forget to make a life. Congratulations to the other trailblazing honorees: Anita Hill, Nadia Murad, Hadeel Anabtawi, and Susan Burton! “We have seen what we thought was unseeable.” No, that wasn’t William Barr on the Mueller report, but Sheperd Doeleman, director of the Event Horizon Telescope Collaboration, announcing the biggest news, at least measured in space time: scientists taking the first ever photo of an actual black hole. It’s located in a galaxy called Messier 87, discovered in 1787 by Charles Messier, who, unlike George Washington, was smart enough to name big outdoor things after himself. The image, a hazy orange ring with, yes, a black hole at the center, electrified not just scientists but pretty much the entire world. The Facebook photo that 29-year-old Kate Bouman posted of herself constructing the image even went viral. And it’s no wonder — because wonder is such a profoundly important part of our well-being. It takes us outside of ourselves and the relentless 24/7 News Cycle of Outrage. It helps us put our lives, along with the annoyances and setbacks we encounter every day, in perspective. We need wonder, and we’re hungry for it. Back in 2017, the solar eclipse was watched by nearly 90 percent of adults in the U.S. — dwarfing the Super Bowl and Game of Thrones combined. In other words, real stars > pop culture stars. The problem is that in today’s always-on culture — with a screen in our hands begging for our attention — bringing the power of wonder into our lives isn’t easy. For starters, we need to look up from our screens. And when we fail to, we don’t just miss the stars — emergency room visits for “distracted walking” have been skyrocketing. We’re so busy documenting moments in our lives that we fail to actually experience the moment. Thankfully, with Messier 87 being 55 million light years away, it’s safe — at least for now — from being overrun by selfie-seekers (unlike the wildflowers of Antelope Valley, California, which resulted in a “Poppy Apocalypse” being declared last month). But wonder doesn’t have to be a result of what we see. As awesome as a black hole is, wonder is just as much about our state of mind, being mindful and open to the moment, and making time to unplug and see the extraordinary in the everyday. • Obsessing over the Facebook page “Duggar Family News: Life is Not All Pickles and Hairspray,” which follows the famously large fundamentalist family’s exploits with a critical — and often hilarious — eye. • Constantly embarrassing my boyfriend Mike by evangelizing Swissted, his music-meets-modernism art print series, to everyone I meet. What are your secret joy triggers? Reply to let us know and we’ll publish some from the community each week. “Sleep Divorce”: When two people in a relationship decide to sleep in separate beds or rooms because of different work schedules, room temperature desires, snoring, etc., so they can get better sleep.